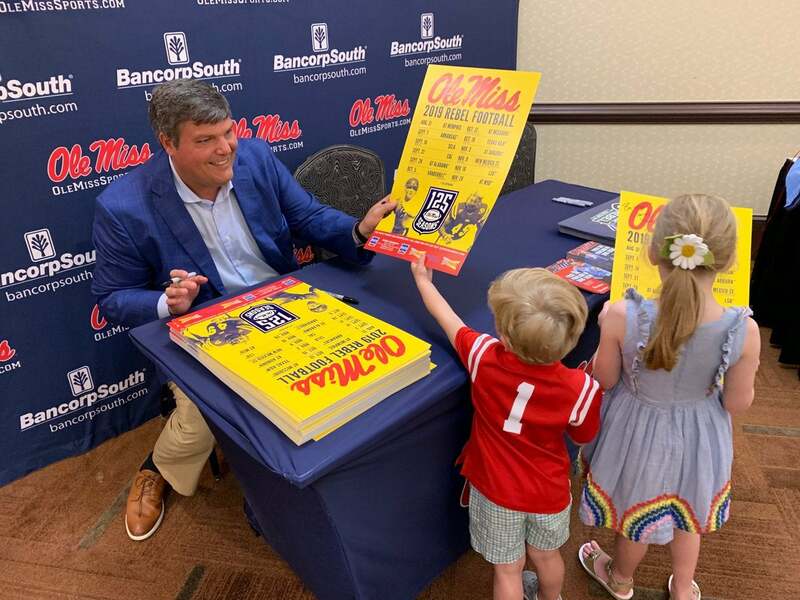 Q: What’s been your overall message on the Rebel Road Trip? Mike MacIntyre is. Defense being in the right spot, whenever I say that, people start clapping. That’s kind of the message I’ve been pushing. Q: What type of support do you feel you have entering year three? Or two, I guess, depending on your perspective. Luke: It’s different for me because I want the same things that everybody wants for this program and that’s to win. It’s different when you’re the interim coach and you get the job. You can’t say, ‘Thanks for helping me get the job, you’re fired.’ But this year is different. I can go out and hire guys that were the best people for the job. I really feel like we were able to do that. Ross (Bjork) was there for me to help me do that because it takes years and contracts to get guys like that. I think it’s all about a commitment to winning. People will support winning. We’ve been through a lot, but I do think everybody can feel us coming out of that; the clouds moving and the sun coming out. We have a clear goal, and that’s to get back to the postseason and be bowl eligible. I kind of equate it to 2012 going to Birmingham. We sold out the stadium and all the beer was gone in the first quarter. People were fired up about that. Building that positive momentum. Q: You’re going to the NFL Draft next week. What do you anticipate your role being? Luke: Selling the program, and I think that’s important. Making as many calls from the green room as you possibly can. It started April 15. We can FaceTime from the green room and promote the program. Even in the midst of all the negativity, we’ve got several young men that were able to live out their dream and have a chance to go in the first round of the NFL Draft. I think that’s pretty cool. Q: Have you had recent conversations with teams about particular players? And if so, what have those conversations entailed? Luke: Sure, every day they’re calling about different people. You can’t speak to particulars about that, but they’re wanting to do their research. No matter where they go, whether it’s first or second round, these guys have an opportunity to fulfill lifelong dreams. We went through all this together, and it’s not just the seasons. I’ve got a relationship with D.K. Metcalf that goes back to — me and Terrence a long time — a skinny 9th-grader in the triple-jump pit. It goes back a long way. It’s cool to see. Q: What is the report and evaluation of Metcalf you provide to teams when they call on him? Luke: I just talk about how good a kid he is and how hard a worker. There are kids that are talented, but when you combine his talent and work ethic, that’s when it becomes really special. I think it speaks to the type of player he is. He’s coming three months off a neck fusion surgery and he’s running a 4.3 (40-yard dash). I didn’t think any agent that was worth his salt was going to let him do anything at the NFL Combine just to protect him to see how he recovers. To get back that quickly speaks to his work ethic and his talent. Q: Was there real concern about Metcalf’s ability to continue in football after the neck injury? Fusion surgery has proven tough for players to bounce back from. Luke: Very scary. That’s the thing we talked about in the hospital bed that next week right after the Arkansas game was, ‘Hey, let’s think long term. Let’s not think short term.’ Because at that time, he was like, ‘Man, I’m not going to be able to play the rest of this season.’ But I was like, ‘I know that’s tough. It’s tough for all of us. But, at the same time, you’ve got to think long term.’ Five, six games wasn’t his entire career. You’ve got to look long term. Sometimes that’s tough for a 20, 21-year-old kid to do. Q: Has the recruiting approach shifted or changed at all now that you’re recruiting to new systems on both sides of the ball with established head coaches who could be up for other jobs fairly quickly? Luke: These guys see it from the big picture. I think that’s really huge. They’ve been in my seat. They’re not looking at it, ‘Well, I’m going to go try and get a bunch of stats.’ These guys want to win. Heck, if they are successful and they do get jobs, we’re all successful. The ultimate goal is to win, and my job is to put the best people around me. You can’t worry about egos and who was a head coach and who wasn’t. You want to get the best people for the job. That’s what I did. Q: The spring football recruiting period started Monday. What’s been the reception from 2020 targets? Luke: Even last year you felt the momentum shift. Even the first signing period to the second signing period, going out and getting two new coordinators and finishing the way we did, especially in the state of the Mississippi — 19 of the 31 being from here. I thought it was a positive momentum shift in recruiting. This year’s a little bit different ‘cause we’re only signing 15 instead of 31, so you’re a little bit more selective. But I do think there’s a definite difference. Luke: They were suspended from all athletic activities. They still have the academic center and the training room, but they’re suspended from athletic activities. If they complete everything, they’ll be back on in the summer semester. They’re suspended for the spring semester. They have a chance to get back summer one. We’re handling it internally. I’ll know where they are at the end of the spring semester. Q: How’s the recovery process going for Jaylen Jones? Luke: It’s tough because he is starting to run, but he did a lot less than D’Vaughn (Pennamon) has to this point. He had a very serious knee injury. But he is starting to run, and we’re hopeful he’ll be back to full speed. We’re counting on him. The plan is for him to be ready for August. He’s going to do the running and lifting full speed. He’s cleared for that. But we’re going to be smart with him cutting. It’s going to be more straight-line stuff. Second summer term we’ll ease him into the change-of-direction stuff. He’s full-go on lifting. Luke: Same. A little bit ahead of Jaylen. Jaylen had a meniscus tear with his ACL, which prolongs it a little bit. Custis is a little bit further ahead than Jaylen, even though it happened a couple of weeks later because of the different type of injury it was.